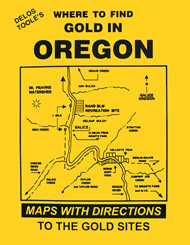 There's gold in Oregon, and this book will help you find it! 144 pages of maps, directions, and tips. A must-have for the Oregon gold hunter! Paperback, 8.5" x 11". Beaver Sulpher USFS Recreation Site Area "A"
Cook and Green Creek USFS Area "F"
Deer Creek USFS Recreation Site Area "C"
Deer Creek USFS Recreation Site Area "E"
Elliot Creek USFS Recreation Site Area "E"
Flumet Flat Campground USFS Area "I"
Gin Lin Trail USFS Area "I"
Green Creek (Cook and,) USFS Area "F"
Hutton Guard USFS Recreation Site Area "D"
Kanaka Flat USFS Campground Area "B"
Mason Dam USFS Recreation Site Area "D"
McCulley Forks USFS Recreation Site Area "B"
Middleton Fork Creek USFS Area "G"
Steve Fork USFS Area "H"